Nelson Wrap Dispensers will increase productivity in your shipping area. The Nelson Wrapper Dispensers will also decrease worker back and hand injuries. Back injuries are reduce as workers do not have to bend over to apply stretch film. Also operators can apply stretch film with the Nelson Wrapper without walking backwards around the pallet. They will always walk forwards reducing dizziness and increase speed of wrapping. Tall loads are quickly wrap with out straining to reach the top as our Nelson Stretch Wrapper has a long 59" handle. WATCH OUR VIDEOS BY CLICK THE ITEM NUMBERS BELOW. The unique braking system allow you to apply a very tight wrap to your pallet loads or bundles. 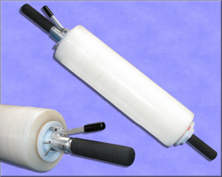 Self oiling UHMPW material helps dispense your film with ease. Foam grip adds to operator comfort.